I was reminded of this saying today when, at the grocery store, I ran into a woman I know from my job. She tragically lost her only daughter a little less than a year ago. My immediate reaction, as it always is when I run into someone I know, was to say the typical: “Hey! How are you?” with a (not insincere, nor completely natural) grin plastered to my face. And of course, that is exactly how I greeted her. She was kind, we traded casual conversations–small talk about the frustrations of grocery shopping on a Sunday, and then we parted ways. It was a very brief conversation, but the whole time my mind was racing, thinking about the pain she must feel for the loss of her child. How each trip to the grocery store might wrack her with memories. How she was no longer buying the types of foods her daughter once loved. How every child she passed was a reminder of what she no longer had. Of course I didn’t express any of this. In fact, this was all projection on my part; emotions that I could only imagine I would feel in her situation. But it hit me– here is one woman in a store of hundreds. I happen to know her and know her story, or at least the bare minimum of her and her husband’s saga that eventually led to the loss of a young and sick child. Here is this one woman who I know has had this incredibly difficult ordeal. But what about the other people in this store right now? How many of them have recently had such terrible losses? We all struggle with our own inner demons. Our issues vary in complexity, but not importance. We all have our own shallow troubles that can be blown out of proportion, but at the time they truly do feel like the end of the world. And, unfortunately, most of us will also have not-so-shallow drama; we will feel the all-consuming, mind-numbing pain of grief after an ordeal of such magnitude that it changes our entire world. At different phases of our life we have different worries and fears, but we are all fighting a battle. At the root of it, life is not easy. We will experience fun and adventure, but no one is without pain. Now, as someone who dislikes conflict and cringes in the face of confrontation, my personal belief system focuses greatly upon the concept of being kind to everyone. Yes, everyone. I’m a thorough advocate of the “kill ’em with kindness” theory. But that’s another story. 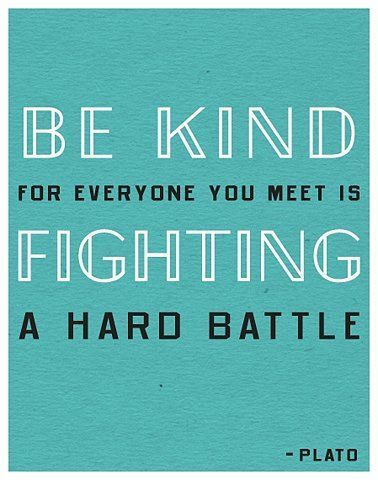 The point I’m trying to make is that it is SO incredibly important to be kind to one another. It takes little extra effort but makes a world of difference. We are all struggling, maybe not today or tomorrow, but each and every one of us is fighting something. Understand that, accept that, embrace that, act upon that assumption. I may be something of a peace monger (in fact, I have a whole theory that World Peace could be achieved by nothing more than puppy dogs and warm cookies– an idealist doctrine, to be sure, but it would certainly work for me). The bottom line, however, is that this world is never without its hardships, so why not do our part to add a little more pleasantness to it. What your email account says about you. Am I the only one who judges people and professionals by their email providers? Okay, maybe that seems a little harsh. I don’t do it intentionally, but for some reason, in my mind of minds, I have come to associate different servers with different…let’s say: degrees of professionalism. For example: The other day I passed a real estate sign for some local seller and the first thing to catch my eye wasn’t the name of the agency nor the agent, but the email address on the sign. It was a Yahoo address– but why should that be so striking? I have a yahoo address (albeit it’s the one I use for junk mail). I have yahoo as my homepage, even. And yet, my first reaction to the company upon seeing the email address: Wow, so this must be some second-rate agency. I give them 2, 3 years max. I mean, come on, why couldn’t they add a touch of class and at least get a gmail account. Apparently, somewhere along the way, in my internet exploits and adventures, I have acquired a prejudice toward the different email servers. So here they are, my preconceived conceptions of what email servers say about their users, despite their (most likely) complete inaccuracy. @Yahoo: The server for children, first-time users, second-rate professionals, or casual relationship. You keep this address to send your junkmail to when you find yourself forced to sign-up for some silly newsletter that you’ll never really read. This is the address you give to your 80 year old grandma who likes to forward you pictures of sunsets accompanied by bible quotes. This is the address you check once a month: you wade through the junk mail whose subject lines makes it clear that they think you have male genitalia or an excess amount of money to send to some Nigerian prince. Every once in a while you find an interesting tidbit or personal email to which you make your monthly, ritual response. Okay, so Yahoo isn’t terrible and I may be over-reacting. I mean, it’s not like it’s hotmail or something. But that’s for later on. @Gmail: This is the site for stuffy professionals, art school hipsters, broke new-grads, and new-age small businesses. I feel like it’s the all-inclusive server, and yet every type who uses it is a stereotype. It’s like when hipsters say they like things ironically…I’m not sure how it’s like that but it just is. @AOL: This person hasn’t let go of their first generation Ipod and still thinks that reality television is a somewhat accurate representation of actual reality. These people continue to mourn the loss of Britney Spears’ sanity and cling tightly to their hope that someday their beanie babies will finally reach the promised market value so they can retire by 40. Of course, any negative attitude I have towards AOL probably dates back to the excessive amount of CDs they sent to my house throughout the early 2000s. You know the ones…And so does every single landfill in America (too bad the go green initiative hadn’t quite reached its peak). And thus, I feel like AOL is stuck in the past. @MSN: The lesser AOL. But also a warm and wholesome, family-friendly server. MSN is like your friendly Avon-selling neighbor: a lovely mother of two and devoted wife who, if you didn’t know any better, you would say has a slight Canadian accent. Doncha-know. @Hotmail: Maybe it’s the word ‘Hot’ or maybe I’m just crazy, but I have to admit that I believe Hotmail is the harlot among the email community. This, however, is not meant to be a reflection upon its users who I’m sure are all very nice 12 and 13 year old myspace users. 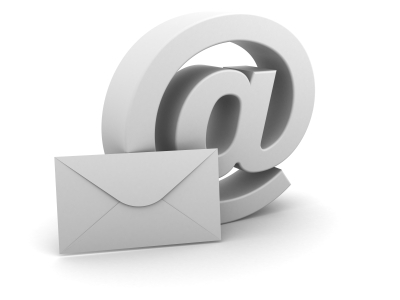 To those email hosts I’ve left out: I’ve yet to pigeonhole you into one of my preconceived opinions. But beware, you are only safe for so long. To those I have offended: Why are you still reading this then? Bon Mots, Blood, Brother’s Blog. Following up my last post comes the mandatory promotion of my brothers new blog. It offers well-written reviews of books and video games by a variety of talented authors. “Here at bm&b, our goal is to give you reviews of over-critiqued books and criticisms of under-critiqued video games. So please, go check it out. And tell him his oh-so-talented sister sent you! Around the time of her 80th birthday, my Grandmother decided to write down her memoirs. Not for publication or as some sort of formal biography, but simply as a keepsake for the family. Having been born in 1919, she lived through a time of major changes and, whether kin or not, it’s hard to not find her stories fascinating. After reading them more recently, I began to wonder about my own legacy. Sure, it seems a bit morbid, but it’s hard not to wonder what you will leave behind after you’re gone. That’s when I realized that, unlike my Grandmother, much of my life and experiences have already been recorded in perhaps an even more permanent format than ink and paper. Yes, I’m talking about the internet. Over the years, I’ve had multiple blogs, some for school and some for personal use; social media accounts, ranging from the now-dated MySpace to the ever-popular Facebook; accounts at numerous sites, from shopping to gaming; papers or pieces published in online formats; and of course, any bit of local news with my name in it can also be found in the great online archive. So you see, if years from now my ancestors decide to look into who I was, they need go no further than the nearest computer. Certainly there’s something less romantic about memoirs from the digital age, but perhaps the most frightening thing to take away from this is the permanency of all our online (and offline) actions. In 2010, Twitter announced that the Library of Congress would be digitally archiving the tweets of all the site’s users since its inception in 2006. Phew, what a relief– years from now my ancestors can view my attempts at being witty with a 140 character limit. What exactly will they learn from this officially documented data? Well, they’ll find out I’m a bit of a complainer, not all that funny, and kind of boring. Of course, while sifting through the thousands of trivial tweets, they may come across some of my activities and opinions– you know, the kind of things one actually puts in a memoir. But what about my other social media accounts? Well, I’m not sure if the Library of Congress has any claims of ownership on my Facebook, but then again there’s no telling what sticks around after you pass on. In fact, this has actually become a major concern for individuals– what happens to one’s online accounts after they die? Sites such as Facebook and Twitter actually have policies set in place to deal with this and, with the proper proof, loved ones can delete the accounts of the deceased. In some cases, they can also choose to memorialize the account instead. Other accounts, such as those on PayPal or Gmail, also have systems in place to deal with such issues. To make things a bit easier, it is becoming more and more common for individuals to make a Digital Will in which they leave instructions on the proper steps to be taken with digital accounts after the person’s death. There are also services, such as Legacy Locker, that store all of the information– passwords, usernames–for loved ones to access in the case of death. So sure, there are plenty of steps to take in order to clear away some of your digital disarray, but there’s no way to completely erase your online presence. Then there’s always the fact that many people, myself included, don’t really care much what happens to those accounts after our passing. I mean, I’m dead and gone, what do I care if Amazon.com still has my order history on record. But then again, I also don’t have anything to hide…do you? And that’s what it comes down to: our lives are out there, on the internet, and with just a little bit of digging, any number of things can be found out about us. And the scariest part is the permanency of it all. So here I am, writing my memoirs every time I tweet, or comment on Facebook, or write a blog post. Look at me, I think I just wrote a whole chapter of my memoirs right here and now. So what do you think? Is your digital legacy something you would like to try to erase, or just another chapter in your memoirs? They say you should never discuss politics with friends—at least those you plan on keeping. But the jury has yet to rule on whether or not it’s an appropriate conversation for blog buddies. Well, this isn’t going to be some biased mumbo-jumbo, just some things I want to get out there and hope everyone will read with an open mind. I think the biggest problem with politics nowadays is that people are too quick to align themselves with a side, and thus that side’s opinions on a wide sweeping number of topics, rather than think about the issues separately. Call it laziness or stubbornness, we are all too quick (myself included) to choose one side and condemn the other. Two party system. Democrat and Republican. We are so quick to apply titles, and indeed to be a part of one of these groups, that we forget to look at the issues. We follow mindlessly because anything less would feel traitorous. So maybe I’m exaggerating a bit, but my point is that we should never forget about that beautiful colored area: grey. The grey area. The in-between. The place where we take a moment to use our grey matter and reflect on each issue individually rather than as part of an all-inclusive package offered exclusively by our party of choice. So maybe I’ve turned into one of those “why can’t we all just get along” people, or maybe I’m just imploring people to think before they vote. Who knows? Who knows how I even got on this topic? Or what sparked my relentless rant? I guess the take-away message here is that sometimes it’s okay to stray from the group, as long as you’re doing what you believe in. I now take you back to your regularly programmed blog.